We've seen portable retro consoles before, but this N64 mod is beautiful. Not only that, but it looks like there will be more of them on the way, so you just might be able to get one. 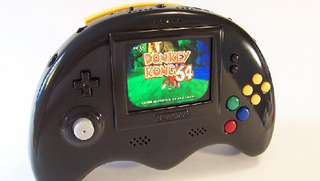 The portable console uses a 3.5" screen, internal memory and Rumble Pak, an Expansion Pak, a GameCube analog stick and 4 hour battery life. If you're interested in the process of making it, there's a progress thread here. Just want to see the final product in action? Check out the video below. Bungle posted this on the Bacman forum for retro console mods, and mentioned that he wants to make more so he can sell them. So start saving up now, because who knows how many he'll be able to make. If you're interested in getting one, you can follow the forum, or subscribe to the YouTube channel. I asked Bungle for some more information on his plans to sell them, and I'll update when he lets me know. Update: If you're interested in getting your hands on one, Bungle says to make an account on bacman.co.uk and make him an offer via private message.